Spaghetti dinner is $10, with a portion of the proceeds going directly to HALO. 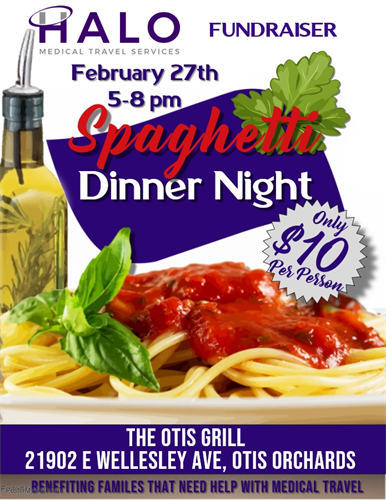 Please join HALO Medical Travel Services at the Otis Grill for a spaghetti dinner fundraiser to benefit families that need help with medical travel. HALO Medical Travel Services, a Care Packages from Alli Organization, serves families that need help with medical travel by connecting them with existing services or providing that service for them when a connection can not be made. We help local families that need a gas card to get to thier appointments all the way up to those traveling out of the area with flights, lodging and other incedentals they may be in need of.